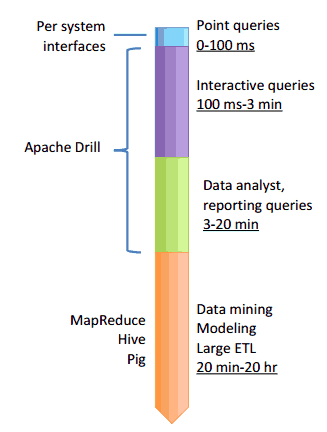 Apache Drill http://incubator.apache.org/drill/, a modern interactive query engine that runs on top of Hadoop. Jacques talked about how Apache Drill is a modern query engine that is meant to be a query layer on top of all big data open source systems. Apache Drill is being designed to make the storage engine as plug-able so it could be the interface for any big data storage engine. The first release came out recently to allow developers to understand the data pipeline. Leveraging an efficient columnar storage format, an optimistic execution engine and a cache-conscious memory layout, Apache Drill is blazing fast. Coordination, query planning, optimization, scheduling, and execution are all distributed throughout nodes in a system to maximize parallelization. Perform interactive analysis on all of your data, including nested and schema-less. Drill supports querying against many different schema-less data sources including HBase, Cassandra and MongoDB. 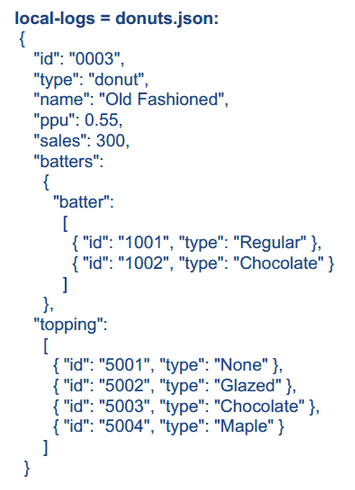 Naturally flat records are included as a special case of nested data. Strongly defined tiers and APIs for straightforward integration with a wide array of technologies. Stefan is the CEO of Datameer and talked about how the company started and where it is now. Founded in 2009 by some of the original contributors to Apache Hadoop, Datameer has grown to a global team, advancing big data analytics. After several implementations of Hadoop analytics solutions at Global 500 companies, the founders were determined to build the next generation analytics application to solve the new use cases created by the explosion of structured and unstructured data. Datameer is the single application for big data analytics by combining data integration, data transformation and data visualization. Customers love us and we work to make Datameer even better each day. Datameer provides the most complete solution to analyze structured and unstructured data. Not limited by a pre-built schema, the point and click functions means your analytics are only limited by your imagination. Even the most complex nested joins of a large number of datasets can be performed using an interactive dialog. Mix and match analytics and data transformations in unlimited number of data processing pipelines. Leave the raw data untouched. Datameer turbocharges time series analytics by correlating multiple sets of complex, disparate data. Resulting analytics are endless including correlation of credit card transactions with card holder authorizations, network traffic data, marketing interaction data and many more. The end game is a clear window into the operations of your business, giving you the actionable insights you need to make business decisions. Data is the raw materials of insight and the more data you have, the deeper and broader the possible insights. Not just traditional, transaction data but all types of data so that you can get a complete view of your customers, better understand business processes and improve business performance. 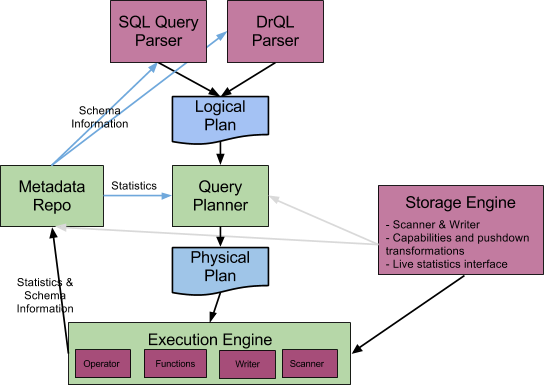 Datameer ignores the limitations of ETL and static schemas to empower business users to integrate data from any source into Hadoop. Pre-built data connector wizards for all common structured and unstructured data sources means that data integration is an easy, three step process of where, what and when. Now you never have to waste precious time by starting from scratch. Anyone can simply browse the Analytics App Market, download an app, connect to data, and get instant results. But why stop there? Every application is completely open so you can customize it, extend it, or even mash it up with other applications to get the insights you need. Built by data scientists, analysts, or subject matter experts, analytic apps range from horizontal use cases like email and social sentiment analysis to vertical or even product-specific applications like advanced Salesforce.com sales-cycle analysis. Check out the Datameer app market. Apache Bigtop is a project for the development of packaging and tests of the Apache Hadoop ecosystem. The primary goal of Bigtop is to build a community around the packaging and interoperability testing of Hadoop-related projects. This includes testing at various levels (packaging, platform, runtime, upgrade, etc…) developed by a community with a focus on the system as a whole, rather than individual projects. Mortar is the fastest and easiest way to work with Pig and Python on Hadoop in the Cloud. Mortar’s platform is for everything from joining and cleansing large data sets to machine learning and building recommender systems. Zero Setup Time: Mortar takes only minutes to set up (or no time at all on the web), and you can start running Pig jobs immediately. No need for painful installation or configuration. Powerful Tooling: Mortar provides a rich suite of tools to aid in Pig development, including the ability to Illustrate a script before running it, and an extremely fast and free local development mode. Elastic Clusters: We spin up Hadoop clusters as you need them, so you don’t have to predict your needs in advance, and you don’t pay for machines you don’t use. Solid Support: Whether the issue is in your script or in Hadoop, we’ll help you figure out a solution. The Mortar Blog has a great video demo on Watchtower. There are no two ways around it, Hadoop development iterations are slow. Traditional programmers have always had the benefit of re-compiling their app, running it, and seeing the results within seconds. They have near instant validation that what they’re building is actually working. When you’re working with Hadoop, dealing with gigabytes of data, your development iteration time is more like hours.